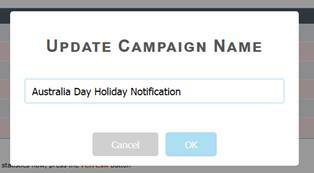 To edit the Campaign Name (the internal reference you give your email campaigns) of your campaigns once they have been delivered. You can now go to the results of that particular campaign and you will see an edit pencil located next to the campaign name. Clicking on this icon will display a pop-up window where you can rename the campaign to what you wish.